Alpine Septic Pumping has a dedicated team of professionals who can come onsite and unplug a mainline blockage or drain that is causing slowdowns or even back flooding from your septic system. After hours charges will be assessed. Main line cleaning is accomplished from the septic cleanout port located near the house foundation or in the crawl space/basement of the house, or even through a toilet. Foundation cleanouts are often cut down flush with the ground or easily found within 1 – 3 feet of your foundation. Oftentimes they are under a deck making locating them for cleaning difficult. We recommend that our customers mark the foundation clean-out with a stake of some kind in the event we need to locate it for cleaning in the winter or when this becomes overgrown with plants and foliage. 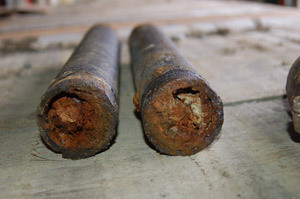 Many times a main line drain blockage is caused by putting things into the septic system it is not designed to handle. Mechanical cleaning tools such as a steel tape snake, high pressure water jet, drum snake, etc. can be employed to clear the drain blockage. (Caustic chemical cleaning solutions should not be used in a drain to avoid the possibility of tank damage). If the system continues to backup after cleaning, we recommend that a video camera inspection of the drain be done. We often find that a septic tank has an impacted baffle which is the cause of chronic backups. We generally determine this by use of the video camera. Once determined, we water jet (usually from the outside foundation clean-out) to clean the impact (which is usually grease). We use high pressure/low volume water to clear sand, grease, dirt, gravel, toilet paper etc. from sewer lines. It is very effective and does not harm the inside of the pipes. Commercial facilities that have grease traps may want to consider an annual water jetting to insure lines are clear and functional. For commercial cleaning jobs, particularly those that have kitchens, such as restaurants and fast food businesses, Alpine Septic also carries and installs an injector system to help reduce the accumulation of grease in drain lines that is not harmful to pipes or tanks. Contact us for more details. An ounce of prevention now is worth a pound of cure when it comes to cleaning drains. Sinks draining slow, standing water in the shower, overflowing toilets … these are all indicators of possible obstructions in the drain pipe and a need for cleaning. Every day we put grease, hair, soaps, oils from lotions or other personal use products down the drain. Over time they can accumulate and reduce the inner diameter of your drain lines resulting in slow drains. Alpine Septic Pumping – Drain Cleaning Division can come and clean out the drains and have them working like new in minimal time. Alpine Septic can also help you maintain the system with the addition of a regular maintenance dose of Bio-Clean, a non-caustic additive that helps to keep drains open and improve septic system performance by adding helpful bacteria to the system. Floor drains, household drains, and drains in general accumulate materials that over time can cause them to function at less than 100% capacity. Cleaning can be required to restore flow rates to the drain. Sand, dirt, powered laundry detergent, grease and oils can accumulate over time and cause blockages that can result in water flowing back to the source and not out to the septic. 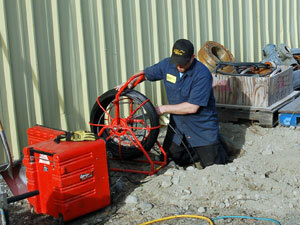 Mechanical cleaning is one of the standard methods to clear a drain. This requires a power snake, water jetting, or other type of snake to break up and push the material blocking the pipe down the line and into the septic. 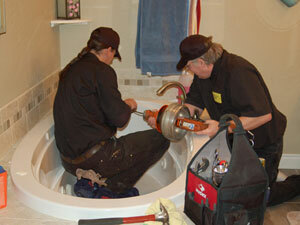 Cleaning drains ins our specialty, so call us at 907-373-2120 next time your drain needs cleaning.